Bentley is hard at work prepping the next model in its Continental line-up: the four-door Flying Spur limousine. 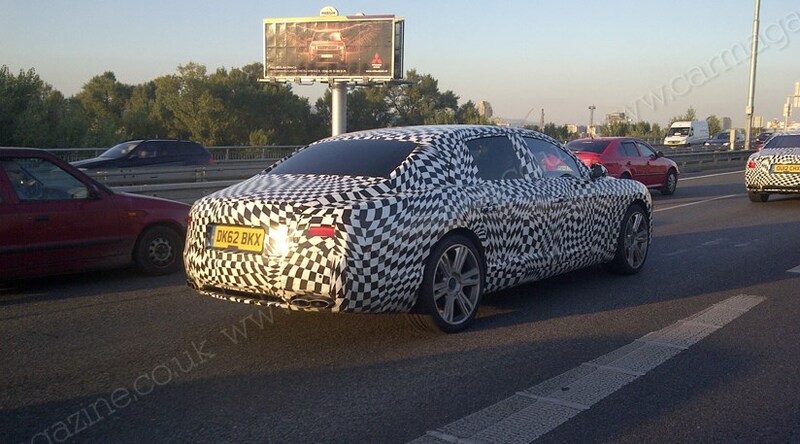 CAR reader Juraj papped two camouflaged cars testing in Bratislava, Slovakia, as Bentley readies its new Flying Spur for a very lucrative eastern European audience. The last time we saw the Continental GT Flying Spur, it was trussed up in Mercedes S-class fancy-dress. These latest spy shots show the car's true shape, minus the Mercedes-esque wheelarches, and there's a glimpse of the quad headlight arrangement we know from the coupe and convertible Contis. The figure-of-eight tailpipes on these UK-registered cars are a tell-tale sign these are V8-powered Flying Spurs. Twelve-cylinder Continentals get oval tailpipes as a subtle cosmetic change; other V8 cues are red badges on the wheel centres and bonnet. What else is new on the 2013 Flying Spur? As with the outgoing Flying Spur, powertrains are expected to be shared between the two- and four-door cars. That means all-wheel-drive in all models, an eight-speed automatic transmission, and a range of engines. 'Entry-level' power comes from an Audi-related 4.0-litre twin-turbo V8, good for 500bhp and 478lb ft. The bi-turbo W12 motor comes in two states of tune: the regular 567bhp verson, and the uprated 616bhp unit, which powers the Continental GT Speed to 205mph. Expect to see the production-spec Bentley Flying Spur arrive in late 2013, priced at around £140,000.